Mike Caulfield responded to my post on data usage to understand college textbook expenditures. The core of my argument is a critique of commonly cited College Board data. That data originating from financial aid offices leads to the conclusion that students on average either spend or budget $1,200 per year with that number rising, while there is more reliable data originating from students showing the number to be half that amount and dropping. If we’re looking to find out if prices for some set of goods are too high, then by definition we cannot look at what people are spending as a reliable gauge, because one of the big effects of “prices too high” is that people can’t afford what they need. If you don’t pay attention to this you get in all sorts of tautologies. This is an important issue, and I appreciate Mike's understanding that I am not arguing that college textbook pricing is an overblown crisis. I agree that the crisis is real and that the hardest-hit are likely low socio-economic class and first generation students. But let's move past these agreements and drop the gloves. It is important to look at both types of data – textbook list prices and student expenditures – to see some of the important market dynamics at play. All in all, students are exercising their market power to keep their expenditures down – buying used, renting, borrowing, obtaining illegally, delaying purchase, or just not using at all. And textbook publishers are suffering, despite (or largely because of) their rising prices. But there are downsides for students. There are increasing number of students just not using their required course materials, and students often delay purchase until well into the academic term. Whether from perceived need or from rising prices, this is not a good situation for student retention and learning. This is not too far from Mike's parable of the Perdimians and the concept of a food (or textbook) deficit. The richer picture should include some measurement of what is needed (the bag of textbooks) and what is spent (the expenditures) and if there are gaps. If we want to use College Board data to understand pricing, however, then we will need better guidance from the Education Department on what to include and not include (for consistency) and we need the data broken down by student demographics. The data right now is fundamentally flawed. That's a high percentage of students avoiding textbooks, avoid or dropping courses, and performing poorly due to costs. And this type of data is only available by asking students. But overall, I suspect Mike and I are on the same page in terms of concerns - the crisis is real, we need pricing and expenditures, and poor or first-gen students might not have access to the same cost cutting measures. On that note, if you accept 2-year vs. 4-year schools as a proxy for the measure of poor / first-generation students, the NACS data backs up Mike's point. 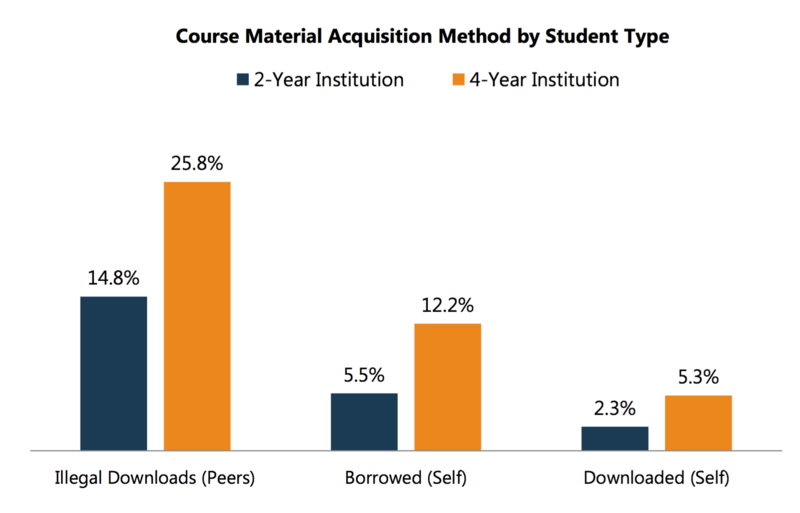 2-year students are far less likely to go get course materials for free. As part of his argument, Mike looked at "first year suggested schedule for a math education major" and looked up bookstore list pricing and rental of used textbooks for those courses over a year. It turns out that $1,019 is very close to Mike's number of $1,072. We need data on both pricing of required course materials (including local substitutes) and expenditures by students. The poor / first-generation problem should be addressed by better data from students - cross-tabs on student expenditures and asking them the impacts of pricing in particular - rather than falling back to College Board usage of financial aid office reporting. 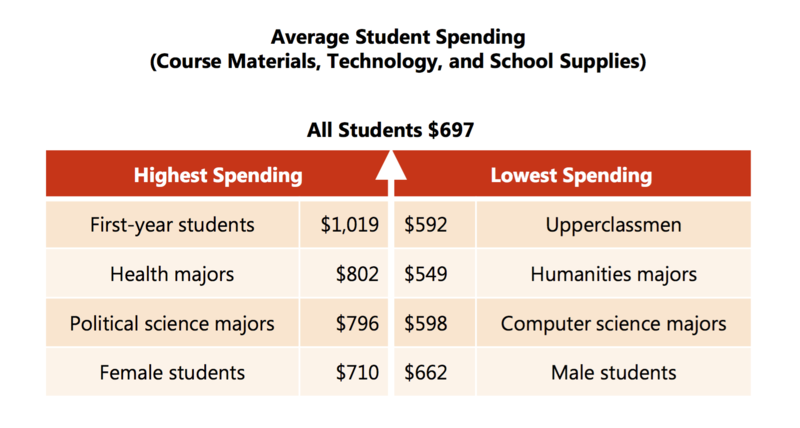 Asking students how much they spend on college textbooks is an excellent question, but it is insufficient. Thanks to Mike for extending this conversation and adding in the challenge of poor / first-generation students. Thanks for this important work you are doing. I share your concern about textbook costs, and also about being transparent and not overstating the problem. I will use this more in the future! Some people have already asked students about textbook spending. David Ernst of the U of Minnesota Open Textbook initiative cites this Florida study… one surprising stat is that 17% of students said that at some point they had failed a class because they couldn’t afford to buy the textbook. http://www.openaccesstextbooks.org/pdf/2012_Florida_Student_Textbook_Survey.pdf. I think this hits home the point that it doesn’t matter how much the textbooks cost: if students can’t afford them, they are too much. In his talks Ernst also shows video of student interviews, one student he interviews describes sharing a textbook with several other people and having to organize his sleep schedule around when the textbook is available, etc. So for better or worse it seems students are struggling to figure out how to afford their textbooks. And you cite cheaper alternatives like rentals but I think it is hypocritical of educators to cite this as a legitimate solution to the problem because it makes it seem as if the knowledge in textbooks is expendable and it won’t benefit students to have access to it in the long term. If the knowledge teachers are providing is so important, why should students be expected to return the textbook at the end of the year, never to reference it again? Sarah, I agree with your first two paragraphs and the 17% stat’s importance. Actually, the video example is also quite compelling. Where we differ if thinking that there is no value in rentals. The importance there is that students are taking control and managing their own costs. I think it to be a mistake to declare that this is of no value and to further decide for students that they should want all textbooks long term. Many textbooks are just not needed beyond the limited scope of a specific class. Why shouldn’t students have an option that fits this need? Where it is a problem is if that is the only option to lower costs and if students rent even though they’d prefer to keep book long term. I’m guessing we’re on the same page here. Maybe it would be useful if someone combined the questions of methods of acquisition (rental, purchase, etc) along with ‘why did you choose this option’, including choice of ‘I wanted another choice but couldn’t afford’.